Hundreds of students from San Fernando Valley middle and high schools spent weeks exploring topics ranging from the science of dance and dizziness to cinnamon’s potential effectiveness as a natural pesticide. The students will present their findings at California State University, Northridge’s 22nd annual Student Research Poster Symposium on Saturday, March 18, at 1:30 p.m. in the Grand Salon of CSUN’s University Student Union, located on the east side of the campus at 18111 Nordhoff St. in Northridge. The event is free and open to the public. The symposium showcases students’ scientific research published in CSUN’s annual New Journal of Student Abstracts. This year’s journal featured more than 200 abstracts by middle and high school scientists. The journal has been published for the past 21 years as a collaboration between CSUN, the Los Angeles Unified School District (LAUSD) and private school teachers to promote science, technology, engineering and mathematics (STEM) for K-12 students. Oppenheimer’s work received national recognition when former President Barack Obama presented him a U.S. Presidential Award for Excellence in Science, Mathematics and Engineering Mentoring in 2010. 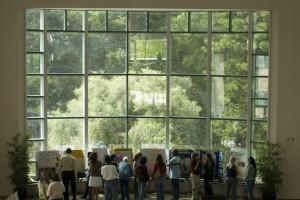 Teachers and students are encouraged to independently, collectively and voluntarily participate in the poster symposium by researching a scientific topic of their choice. Terri Miller, a retired LAUSD health and science teacher, has encouraged her students to publish in the journal and take part in the symposium for 17 years. Miller currently volunteers at Saint Catholic of Siena, running a research club that helps students participate in the research symposium. Every year, Miller’s classes voted as a group on a research topic in which springtails (collembolans) — six-legged organisms closely related to insects — are used as test subjects for six weeks. During poster presentations, students showcase their abstract, problems, hypotheses, materials and methods, graphs and data, and their conclusion. To view students’ published abstracts, visit the website http://scholarworks.csun.edu/handle/10211.3/125029.